ST-BM-01 Fabric Winding Machine - Fabric Batching Machine with optional data collection and analysis system (4-point system) to handle a wide range of fabrics, especially for continuous process “A” frame batch and re-winding to small rolls. ST-BM-01 Fabric Winding Machine - Fabric Batching Machine with optional data collection and analysis system (4-point system) to handle a wide range of fabrics, especially for continuous process “A” frame batch and re-winding to small rolls. This machine can provide synchronised fabric input or output to “A” frame with constant tension control, with peripheral fabric contact for delicate or heavy duty fabrics. AUTOMATED CAMERA INSPECTION SYSTEM COULD BE INSTALLED ON FABRIC WINDING MACHINES. NEWLY DEVELOPED AUTOMATIC FABRIC INSPECTION (CAMERA), LABELING, CUTTING, TAPING AND PACKING MACHINE WILL COME SOON. "A" frame fabric is unwound from non-contact centre driven system and wound by surface contact small rolls, especially ideal for checking delicate or heavy duty fabrics. 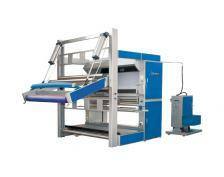 Speed is controlled by an adjustable light accumulation rollers for automatic fabric synchronisation. Fabric can be checked under the aid of different viewing and lighting options. Fabric roll length can be taken by industrial standard measuring systems with digital readouts to give consistent fabric roll assessments. The whole machine is controlled by PLC and the machine can be easily operated with optional Touch Screen. Fabric control at all times to generate consistent roll width and edge output. Optional systems are available for different fabric input and output presentations, continuous fabric input and plait input or output. 100% fabric inspection with software for accurate fabric roll analysis and printout. Fabric sample can be taken by automatic linear cutter and the rest fabric can be stitched by automatic sewing machine for on going checking.